Life After People: The Series is an American documentary series created by David de Vries as a spin-off of his two-hour special Life After People, in which scientists and others speculate what the earth, animal life and plant life might be like if humanity no longer existed, as well as the effect humanity's disappearance would have on the artificial aspects of civilization. Speculation is based upon documented results of the sudden removal of humans from an area and the possible results which would occur should humanity discontinue its maintenance of buildings and urban infrastructure. The hypotheses are illustrated with CGI dramatizations, depicting the possible fate of such icons as the Empire State Building, Buckingham Palace, Sears Tower, the Space Needle, the Golden Gate Bridge, and the Eiffel Tower. The series premiered in the USA on The History Channel on 21 April, 2009. 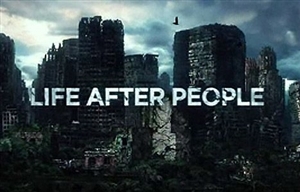 Life After People: The Series premiered in South Africa on DStv's The History Channel on Friday 20 November 2009, at 20h30. See "Seasons" below for seasonal broadcast dates and times. Season 2 premiered on The History Channel on Friday 30 July 2010, at 20h30. New episodes broadcast weekly. There are 10 episodes in the second season. Life After People: The Series begins in the moments after people disappear. As each day, month, and year passes, the fate of a particular environment, city or theme is disclosed. Special effects, combined with interviews from top experts in the fields of engineering, botany, biology, geology, and archeology provide an unforgettable visual journey through the ultimately hypothetical. As modern metropolises like New York, Los Angeles, Chicago and Washington DC are ravaged by nature; the series exposes the surprising insights about how they function today. Basing this futuristic world on the surprising history of real locations, already abandoned by man, like a century-old shack in the arctic and an abandoned island that was once the most densely populated place on earth are featured in the series. In every episode, viewers will witness the epic destruction of iconic structures and buildings, from the Sears Tower, Astrodome, and Chrysler Building to the Sistine Chapel - allowing viewers to learn how they were built and why they were so significant. Big Ben will stop ticking within days; the International Space Station will plummet to Earth within a few short years, while historic objects, like the Declaration of Independence and the mummified remains of King Tutankhamun, will remain for decades. The series will also explore the creatures that might take our place. With humans gone, animals will inherit the places where we once lived. Elephants that escape from the LA zoo will thrive in a region once dominated by their ancestors, the woolly mammoth. Alligators will move into sub-tropical cities like Houston, feeding off household pets. Tens of thousands of hogs, domesticated for food, will flourish. In a world without people, new stories of predators, survival and evolution will emerge. Humans won't be around forever, and now we can see in detail, for the very first time, the world that will be left behind in Life After People: The Series. At an oil refinery in Houston, pressure in the oil distillation tanks, which is monitored by a human operator, is released into the atmosphere by emergency valves in a cloud of flammable gas. A spark ignites the cloud and the whole refinery explodes. The fuel tanks catch fire and burn for days. Without humans to maintain them, power plants across the world begin to shut down. In New York City, Times Square is still ablaze with light, but is silent without people. As museums lose power the ideal conditions for the preservation of Egyptian mummies no longer exists and they begin to naturally deteriorate. Breweries in St. Louis explode when built-up pressure ruptures fermentation tanks. Without power to run pumps, the New York City Subway begins to flood within 36 hours. Times Square finally goes dark. The first heavy rainstorm floods Chicago when man-operated flood gates remain open, leading to a series of events that will eventually flood the entire city. Without air conditioning, the wax celebrities at Madame Tussauds in Las Vegas melt. The machinery that filters and oxygenates the tanks at the Aquarium of the Americas shut down and the fish begin to suffocate and succumb to increased bacteria levels. Without human hosts, Head lice begin to die off. Near Pearl Harbor, the hands atop the clock of the iconic Aloha Tower, in Honolulu, stop moving. In London, Big Ben stops running when no one is around to rewind it. Without people to control their spread, water hyacinth (imported from South America) takes over Florida and Texas. Without humans to clear them away they absorb all the oxygen from the water and suffocate surrounding plant life. Some greyhounds have escaped from the many dog tracks around the United States. Their competitive nature keeps them from working together to get the food they desperately need. In New York City, the Asian Long-horned beetle which arrived from China in the 1990s easily infest the trees in Central Park without humans to curtail the infestation. At Buckingham Palace, the Queen of England's corgis have been trapped inside and are desperate for food. Worldwide, animals trapped inside homes die unless they can escape. In zoos, many animals suffering from starvation will have escaped their cages. From Japan to California, 3.5 million tons of garbage goes uncollected and storms wash some of it out to sea increasing the Great Pacific Garbage Patch. In North America, starving wolves begin to make their way to the smell of rotting food in kitchens formerly occupied by humans. The pumps that send water down the aqueducts from Owens Valley to Los Angeles fail and the water supply has run out. The 400,000 human embryos cryonically frozen in clinics in the United States begin to thaw and decompose. Aboard the International Space Station the "Immortality Drive", a computer disk containing the digitized genetic information of some extraordinary humans remains the last hope for some future intelligence to restarting the human race. Kudzu grows freakishly in the southern United States. In Los Angeles, without water, the green grass has dried up and many non-native species of plants like the Canary Island palms wither and the city begins to be reclaimed by the desert. In Washington, D.C. the opposite is happening, with no water being pumped away from the city, it begins to flood. Most starving domesticated pigs will have broken out of their barnyards. They begin breeding with wild pigs, creating a leaner, more aggressive species of wild hog. Without electrical power, the automatic relighting system of the John F. Kennedy Eternal Flame fails when a heavy rainfall extinguishes it forever. In Rome, Michelangelo's artwork on the ceiling of the Sistine Chapel has been without protection since the computerized climate control system failed, but the lack of moisture and body heat from visitors is actually helping preserve the works of art. After depleting all the food supplies in Buckingham Palace, the Queen of England's corgis try to survive in the outside world. With no one to innoculate them, escaped domestic animals catch rabies. Deep in the ice of Norway, the Svalbard Global Seed Vault is the world's reserve of crops. Seeds from every plant in the world are kept here in case agriculture ever needs to be restarted on Earth. Without people, it is beginning to warm up, threatening the lifespan of the seeds. On Ross Island in Antarctica, the expedition hut of Robert Falcon Scott and Ernest Shackleton remains preserved as it has for 100 years. With the help of abandoned swimming pools, mosquitoes thrive and the West Nile Virus spreads. Lakes and rivers all over Arizona completely dry up, killing everything that once lived there. The birds of Hawaii are flocking to their new favourite Island paradise, the wooden decks of the USS Missouri. In Boston, the USS Constitution, the world's oldest commissioned warship is still afloat, but the automatic bilge pumps have stopped working when the power died, causing the ship to fil with water and sink within the year. The ivy at Wrigley Field in Chicago begins to grow out of control. In New York City, the ice rink at Rockefeller Center Plaza becomes a garden. The gold skin of the Prometheus statue, is stripped away over the years exposing the bronze beneath. Plants begin to grow in the multiplying cracks over the highways of Los Angeles. The last survivor of the Aquarium of the Americas, a rare white alligator, dies. Humid air ravages the Burj Al Arab with mould and bacteria. Burmese pythons, once escaped pets, begin an invasion in the Florida Everglades, growing so large they compete with alligators. The series takes a look at the Americana Amusement Park in Ohio showing a real example of a level of decay that can take place in just a few short years after people. The wires holding the trolleys in San Francisco rust and snap, sending the cars careening out of control all over the city. Across the bay, the weakened ropes holding a 50,000 ton ship snap sending it adrift on a collision course with a bridge and sink. The International Space Station loses altitude and falls to Earth, destroying the "Immortality Drive" with it. The wind powered Ricoh sign in Times Square finally goes dark when the light bulbs burn out. Horses go wild and thrive on America's grassland. Those used by the NYPD and to pull carriages leave the city and may roam to the grassy beaches of Long Island. Weeds transform the historic streets of Boston. The walls and stands of Wrigley Field are now covered in ivy and thick buckthorn while shrubbery takes over the ball field. In Miami, escaped chimpanzees follows flocks of birds into downtown apartment buildings to eat their eggs. One intelligent chimp realizes that they need to let some of the eggs survive to extend the food supply. Every casino in Atlantic City has become a potential bat cave as the animals move in. The Willis Tower (formerly known as the Sears Tower) is slowly deteriorating. Forest fires spread out of control and parts of Los Angeles burn to the ground, including the interior of the U.S. Bank Tower, the plant life in between the fireproof stainless steel panels of the Walt Disney Concert Hall, Grauman's Chinese Theatre and the latex paint of the Hollywood Sign. At Independence Hall, broken windows allow sunlight to beam down on the Declaration of Independence. Protected from the elements in its airtight case, the sunlight will cause the letters to fade away. Massive sandstorms called haboobs run rampant over Phoenix. In France, "Lascaux 2", a plaster replica of the prehistoric cave Lascaux crumbles away, but the original cave continues to thrive. In Atlantic City, the deteriorating structure known as Lucy the Elephant is on its last legs, and soon a bad storm knocks it down. In Hawaii, the lines holding the USS Missouri to the docks succumb to corrosion and decay. The warship, now free of its moorings, floats away but only gets so far when it bottoms out in the mud. Houston turns back to a swamp and the Astrodome becomes an enormous bat cave where insects and fungi also thrive. Miami begins to look like a jungle as invasive plants like Brazilian Pepper begin taking over habitats. At the Aerospace Maintenance and Regeneration Centre, the hundreds of stored military aircraft begin to decay once their protective tarps open and coatings peel and off in the wind. Birds build nests in the exposed engine intakes and cowlings. In museums, without functioning environmental systems to preserve them, insects and fungi ravage the Egyptian mummies. The same fate happens to the enbalmed body of Lenin. Soon nothing is left but dust and bones. At the bottom of the Pacific Ocean, a nuclear Russian submarine lies intact, but water pressure and corrosion develops cracks in the casings of its payload of nuclear warheads and they explode when chemicals inside make contact with seawater. The explosions however, are not powerful enough to detonate the nuclear warheads. The series gives a real life example of 25 years of abandonment by visiting Centralia, Pennsylvania, whose population has largely fled since 1981; the result of a coal mine fire which began in 1962 and continues to burn to this day. By now, most of the world's dairy cows have died out. Those that figured out how to mate have managed to preserve the species and the process of evolution starts taking them back to the wild. Without humans caring for the land and fortifying the beaches regularly, on Long Island low-lying areas become flooded without human control beach front erosion. The series gives a real life example of 35 years of decay by visiting Hashima Island, once a thriving coal mine where thousands of people were housed in apartments. Abandoned in the 1970s, the island now holds a small city of skeletal and gutted buildings battered by the sea. The series gives a real life example of 45 years of decay with North Brother Island just off Manhattan Island in New York City. The island has served many purposes over the years, from housing returning World War II veterans to quarantining victims of infectious diseases, and as a rehabilitation clinic for drug addicts. For the last 45 years however, it has been abandoned and structures on the island are in shambles. Most buildings in Atlanta are brought down by invasive kudzu. In Chicago, Wrigley Field is almost unrecognizable under a heap of overgrown vegetation and shrubs. In Los Angeles, a 8.0 magnitude earthquake collapses the top floors of the U.S. Bank Tower. The quake also topples the Los Angeles City Hall once the foundation shock absorbers fail to steady the structure. On the hill overlooking the city, the metal letters of the Hollywood Sign are finally brought down. Ravaged by pyrite disease, dinosaur skeletons in museums across the globe begin to fall apart. The gargoyle statues of the Chrysler Building fall to the ground after corrosion loosens their mounts. The plant seeds frozen in the Svalbard Global Seed Vault will have died. Atlantic City's Steel Pier is now just a skeleton of its former self. In San Antonio, the Tower Life Building leans to such an extremity that it topples. Mould and metal corrosion finally collapse the Burj Al Arab in Dubai. Here the series gives a real life example of 65 years of decay with the British village of Tyneham which was abandoned during World War II when the British government took over the area to use it as a training ground for American troops. No one has lived there since 1943 and nature has partially collapsed the stone buildings. In Shanghai, flooding in the city weakens the foundation of the Oriental Pearl Tower and causes the tower to collapse. In Pearl Harbor the USS Missouri is now under a cover of green. Seeds dropped by birds have made their way into every crack in the wooden deck, causing vegetation to grow over the hull. Bridges begin to collapse when their protective paint flakes off and are no longer protected from moisture and corrosion. Among them is Boston's Leonard P. Zakim Bunker Hill Memorial Bridge. The supports under the sky bridge of the Petronas Twin Towers buckle because of corrosion, and the sky bridge collapses. In Philadelphia, the Liberty Bell falls to the ground and cracks completely in half. The former village stray dogs have now evolved back into the wild predators they were before they were domesticated. Their population however, has dwindled. Here the series gives a real life example of 90 years of decay with the western ghost town of Rhyolite, Nevada. A former gold mining town it was once a booming city built on the backs of miners. Now, 90 years after the gold dried up, the town has been left to die. The masonry buildings have nearly withered away by winds and sand. Big Ben, the Brooklyn Bridge, the Golden Gate Bridge, the Houston Astrodome and the Chicago 'L' collapse. Washington D.C. reverts back into a swamp where beavers thrive, damming up the Potomac River. In Los Angeles, some areas of the former highways collect rainwater forming small lakes and ponds that attract wildlife during their migrations. In New York City, the Roosevelt Island Tramway collapses. Without humans there to constantly rebuild the beaches of Miami, once luxurious beachfront hotels are completely overrun by the ocean water. The Blue and Green Diamond towers collapse into each other and the Seven Mile Bridge falls apart. In Phoenix, decades of sandstorms and monsoon rains leave it devastated. Many of the buildings collapse from the weight of mud and sand that have collected. At Cape Canaveral, the Rocket Garden is destroyed by hurricanes. At the Louvre Museum in Paris, the Mona Lisa is eaten away by death watch beetles. In Las Vegas, the "Welcome to Fabulous Las Vegas" sign is faded away by windblown sand and the once magnificent Luxor Hotel Pyramid is now in ruins. In Boston, the Prudential Centre collapses into the lush gardens that have overrun the city. Elephant herds roam free in the American West filling the ecological niches that mammoths and mastodons left vacant at the end of the last ice age. In many cities, skyscrapers have become high-rise ecosystems, with house cats as the apex predators. Detroit's Renaissance Centre shatters and collapses after decades of extreme weather. In Houston, the JP Morgan Chase Tower finally collapses. The same thing happens to most tall structures in Chicago, such as the Willis Tower. With the collapse of the apartment buildings in Miami, the inhabiting chimps have moved to the Everglades. What they have learned over the last 200 years could give them the building blocks they need to create a new civilization. The "Welcome to Las Vegas" sign falls flat on the ground. In San Francisco, only the skeletal towers of the Golden Gate Bridge remain after the road deck collapses. The Grand Canyon Skywalk breaks away from its mountings and falls into the canyon. In New York City, the Empire State Building and the Chrysler Building finally collapse. In Denver the Wells Fargo Centre collapses way under the weight and corrosion caused by 200 years of snowfalls. Outside of Denver on the Colorado prairie, the descendants of domestic cattle have carved out a new way of life. Bison, however, dominate the landscape once again. In Chicago, the John Hancock Centre finally collapses but outlives the more massive Willis Tower. The weight of the Statue of Freedom on top of the United States Capitol collapses the corroded iron dome. By now, the United States Constitution has faded away inside the collapsed rotunda of the National Archives and Records Administration. In St. Louis, the Gateway Arch falls when the keystone buckles and finally gives way. In Hawaii, water has penetrated the hull of the USS Missouri. It floods and begins to sink deeper into the mud of the harbour bottom. Some experts say it could last as long as 20,000 years. Eventually, the warships will become an underwater reef teaming with sea life. In New York City, the Statue of Liberty breaks in pieces and sinks into the ocean. The rabies outbreak finally reverts to natural levels. Philadelphia is now a forest, but the Liberty Bell still remains proudly within its protective walls. 100 yards away, the Declaration of Independence lies in the rubble of Independence Hall. Heat and light have left the paper brittle and a blast of air penetrates the worn case causing the fragile document to disintegrate. Though Michelangelo's frescos are still recognisable after so many centuries, the ceiling of the Sistine Chapel collapses, bringing down the entire building. In Georgia, The Confederate Memorial on Stone Mountain outside Atlanta, and the Washington Monument in Washington D.C. may stand as the sole evidence of those city's locations. The series gives a real life example of 500 years of abandonment with Cambodia's Angkor Wat temple city where nothing is left but stone structures overgrown with trees. Not far away, the Petronas Twin Towers collapse after five centuries of tropical sun and moisture. What remains of the U.S. Bank Tower finally collapses after a moderate earthquake. Almost all traces of human culture are buried beneath vegetation and sand. The Earth itself will have buried all of man's cities. The ruins of New York City have been swallowed by nature. Rivers flow where taxicabs once drove. The Taj Mahal in Delhi collapses after a fairly large earthquake, and rising sea levels flood the area where Washington D.C. once stood, leaving a highly degraded, but still erect Washington Monument emerging over the waves. After 10 centuries without people, Las Vegas has completely disappeared. Meanwhile, on the Moon, the three Lunar Roving Vehicles left behind from the Apollo 15 through Apollo 17 missions will remain in near-mint condition barring degradation or destruction from meteor impacts. As it was after the last ice age, Phoenix again becomes a vast savanna. Plants and creatures now flourish in this lush paradise. New species rule old habitats, familiar landscapes have been transformed, and man's works have fallen. Because it is basically held together by gravity, the medieval Cathedral of Notre Dame in Paris may still stand and be recognisable. The Confederate Memorial, carved on Stone Mountain in Atlanta, is one of few indications that man ever inhabited the area. Most of what man has built has long eroded or been destroyed. Almost all traces of human civilization have been buried under sand and vegetation. Descendants of escaped New York City horses roam the beaches. Because of the lack of nutrients available, they have evolved to be much smaller than their ancestors, but they survive. Buried underground, the vault of the Federal Reserve Bank in New York City, still holds $200 billion of gold bars intact. In New Orleans, plastic and glass Mardi Gras beads are still intact, buried under soil and vegetation. The final seeds in the Svalbard Global Seed Vault die. Atlantic City is now surrounded by an inland forest. The Golden Records aboard the Voyager space probes are damaged beyond recognition after centuries of collisions with dust and space debris. A new species of camelid, descending from escaped camels from a ranch near Las Vegas, evolves in the plains to resemble the guanaco with the low lying vegetation created by the new ice ages. San Francisco has completely disappeared. All that will remain from the existence of human beings are our fossilized bones. The series airs exclusively on The History Channel, on Fridays at 20h30. There are 10 hour-long episodes per season.